The Greatest Squat Article Ever! The squat is the king of lifts and Team Juggernaut is home to the kings of squatting. The authors of this article have raw squatted [email protected], [email protected] (no wraps), [email protected], [email protected], [email protected] (no wraps) and [email protected] and are among the best, if not THE BEST, squatter in the World in their weight classes in the history of powerlifting. This article will show you the exact squat training cycles that yielded Brandon Lilly, Blaine Sumner, Eric Lilliebridge, Chad Wesley Smith, Dan Green and Pete Rubish, their greatest squat performances ever. In honor of Squat Week I am going to share with you my best squat cycle to date. The important thing when planning a cycle is to remember the same cycle WILL NOT work over, and over. You have to look at many factors in moving forward, and that is why competing is so important. You get a reference point of evaluation, and you get to determine your strengths, and weaknesses moving forward. The human body will never allow you to continuously progress in all areas, so you have to try and milk your strengths, and strengthen your weaknesses, and hope to find a happy balance that leads to PR’s. I reasoned that many of my weaknesses were due to training dominantly in squat gear. This is in no way the gears fault, but mine. I had let myself hide behind the layers of material, and it covered my weaknesses pretty well. But competing raw was going to completely expose them, so this is how I went about fixing them. I picked two meets in consecutive weekends the XPC Semi-Final, and The SPF Backyard Meet of the Century. I started by mapping backwards… That is important, never map forwards, trace backwards. Since I squatted 800, and would resume training almost immediately I based my numbers off of 780, because I feel that I could replicate a 780 at any time, and I wanted to keep my weights in check so this is what I did. Explosion Week- 510 (65%) no wraps, 3 sets of 2. Explosion Week- 550 (70%) for 3 sets of 2. Meet Week- Monday and Tuesday I always do Full Body Workouts. These take about 15-30 minutes, allow me to break a good sweat. I do a plate on squats for very deep reps, and bench just to stay flexible. I do lots of push ups, band goodmornings. Anything I feel will loosen me up. Thursday- (If lifting Saturday, I do this on Friday if lifting Sunday) Work up to 50% of opening squat for 3, 50% of opening bench for 3, and repeat full body workout. *If you don’t have the ability to do reverse bands, just make small jumps in weight when indicated, 15-30 lbs. at most. This squat cycle allowed me to compete at the XPC Semi Final and achieve a 3 for 3 day in squats going 727.5, 788, 804.5. The very next weekend I was able to go 760.5, 810, and 826.5 at the SPF Backyard Meet of The Century, and my totals were 2138.6, and 2204 lbs. I believe this method of rotating my lifts over the course of 3 weeks, and doing the specialty work on my second movement really made it possible for me to improve, but also build the ability to repeat the effort within seven days after flying across the country. Brandon Lilly is very well traveled, Elite powerlifter. He has trained at Guerrilla Squad Barbell, Westside Barbell, Lexen Xtreme, and is now home at Berea Barbell. In his strength journey he has competed in bodybuilding, strongman, and powerlifting. Brandon is one of only 19 men to ever total over 2200 raw, having 2204 which ties him for 16th all time (826.5 squat, 573 bench, 804.5 Deadlift). He also amassed a 2530 total in Multi-Ply, and has best lifts of 1005 squat, 820 bench press, and 765 Deadlift. 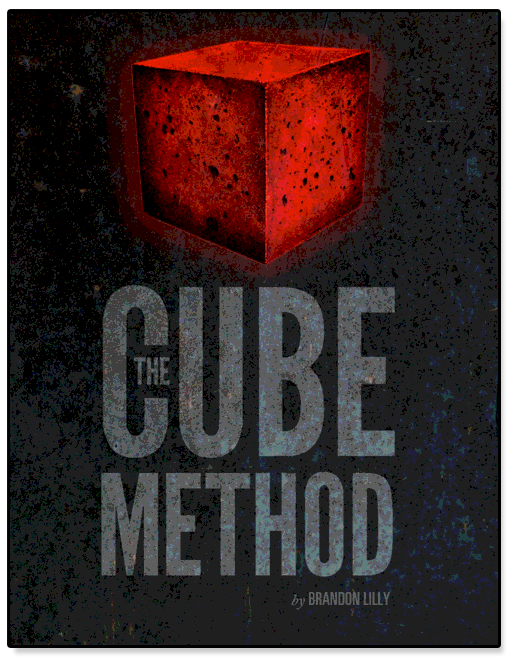 Brandon is the author of The Cube Method and is aiming to create a paradigm shift in the Powerlifting world. Weeks 1-4: “Hypertrophy” – this builds the base for the cycle. The first week will probably make you excruciatingly sore but it’s important to break through this and have your muscles conditioned for the high rep, high volume work that will follow. Weeks 5-8: “Strength” – this 5 X 5 block is the ultimate pursuit of high volume. The body will be conditioned for it after the Hypertrophy block. The 5 X 5 will be lots of reps and allows you to hone and nail down your technique. Weeks 9-12: “Power” – This 3 X 3 push has always been key for increasing the weight and this is the money maker in terms of using the results from the first two blocks and transitioning those hypertrophy and strength gains into serious squats leading up to the meet. This block is a major taper in volume from the previous block but the intensity increases. Weeks 13-16: “Peaking” – This is the final push towards the meet. The strength and technique are nailed down at this point and it becomes about acclimating your body to heavier loads and achieving the perfect taper towards into the meet. Volume comes way down and intensity peaks 2 weeks prior to the meet. Week 16 is the meet. The overall goal of this squat cycle is to lead in with high reps to condition the muscles and prepare for the work ahead, then to increase the volume and intensity and build a solid foundation with the 5 X 5, followed by putting the hard work to good use and increasing the intensity and dropping volume with 3 X 3, and finally peaking for the meet. I like to hit my opener for two singles when I am two weeks out, and deload the week before. This is how I have achieved the best super-compensation heading into a meet. Some will scoff at the % numbers as they seem to be insignificant; but they have a solid purpose and are important for manipulating the Volume/Intensity curves leading into a meet. I also deload every 4th week and treat this as a speed week. Throughout the cycle the speed day intensities increase and the volumes decrease. As for assistance work – you should be so entirely drained that you don’t have the energy to do a bunch of assistance. I do 3 assistance exercises – a squat stimuli, abs, and box jumps. For the low bar/leaning squatters, do 3 weeks of good mornings/1 week of front squats. For high bar/upright squatters, do 3 weeks of front squats/1 week of good mornings. Then do heavy abs, followed by box jumps. Keep the sets/reps in line with what the main squat protocol is. Good luck and train hard! Blaine Sumner is a drug-free powerlifter who competes in the IPF and USAPL both raw and single ply. He holds the IPF Raw World Record for Squat (881 no wraps) and Total (2,056) in addition to winning the 2012 IPF Raw World Championship. Sumner played Division II football at the Colorado School of Mines where he started at nose tackle for 4 years in addition to scoring 8 touchdowns as a short yardage fullback. He also set NFL testing records for 225 bench reps (52) and Kirwan Explosive Index (95). In addition to having a 33” Vertical Jump and 50” box jump at 350 lbs., Sumner was a 4 sport athlete in high school (Football, Wrestling, Lacrosse, Track). He is originally from Colorado and now lives in Oklahoma City where he trains at HATE Barbell and works as a Petroleum Engineer. The best training cycle I’ve ever had on squats was the previous one I just did back in September/October when I was training for the backyard meet of the century at Super Training gym in Sacramento, California. I did a 6 week training cycle for that meet. The first squat workout I singled up to a max rep set of 5 reps, my previous best before that was 740lbs x 5 in belt and wraps and that first workout for the training cycle I beat it with 755lbs x 5 in belt and wraps, so at that point I knew I was a head by quite a bit from the last cycle. I went 15lbs above my previous best because I was feeling really good that day. The next squat workout 2 weeks later I singled up to a max rep set of 3 reps, my best before that was 800lbs x 3 in belt and wraps and I beat that by doing 820lbs x 3 which was the most I’ve ever done for reps and was by far my best squat set ever. I was actually planning on doing 810lbs for reps that workout but again I felt really good and strong that workout so I went a little heavier on my top set. After that workout I knew I was in the right path to hitting a big PR at the meet. 2 weeks after that squat workout, I worked up to a weight I was planning on hitting for my 2nd attempt. I singled up to 850lbs in belt and wraps and hit it easy with a lot more left in me. After that I had 2 weeks to rest on my squats until the meet and my plan was to break my previous meet PR 854lbs on my 2nd attempt. At that meet I opened up with 352.5kgs/777lbs, took 390kgs/859lbs on my 2nd for a meet PR and tried 410kgs/903lbs on my 3rd but lost my balance at the top after I finished the lift and got back on my heals a little too much. I pretty much only tried that weight because Stan Efferding tried it too and it would have been an all-time world record. I did another meet 2 weeks after that meet because I really wanted another shot at breaking the all-time world record squat and because I knew I could keep my strength peaked for another 2 weeks. All I did between meets was light high rep accessory work and just rested up until the next meet. At the UPA Power Weekend (2 weeks after the Super Training meet) I opened with 350kgs/771lbs, took 375kgs/826lbs on my 2nd and went for the all-time world record on my 3rd attempt. The previous all-time world record raw w/ wraps @ 275lbs was 395kgs/870lbs and I broke it with 400kgs/881lbs and had a little bit left in me too. I made a smaller jump on my 2nd attempt to save it all for my 3rd attempt squat and it felt great. This squat training cycle is something that I have repetitively done for my squat cycles meet after meet for years. This is what has led me to my all-time world record raw squat in my weight class. Doing heavy max rep sets leading up to a meet has built my squats to where they are now and has made my squats strong all year round. I can pretty much hit a heavy single any day of the week when I’m fresh and not peaking for a meet and still be within 93-95% of my all-time best due to the training I have put myself through to get to where I am now. The heavy max rep sets really help you develop strength in all areas of your squat because you’re taking yourself to almost failure in that one set and everything is fatigued by that last rep. I’m standing there with all that weight on my back, gasping for air and not knowing if I’m going to come back up with that last rep or not, but I fight through it and give it everything I’ve got and my spotters and training partners push me and yell at me to get it. That kind of training will really show what you’re made of and will either make you or break you. It also builds up my confidence like crazy and I feel like I can smash heavy singles come meet day. I have had other people try this training too and it has worked great for them, most are surprised at how much they can put on their squat by doing just one max rep set for each workout leading up to a meet. As you can see, I don’t lift heavy at all 2 weeks before a meet. The last heavy training day is on week 6, and between weeks 6 and 8 (meet day) is all light training and de loading to be 100% recovered and peaked for competition day. Eric Lilliebridge had a top #3 raw total ranking in world in the 275 weight class at just 19 years old. He had successfully totaled 2,065lbs raw in belt and knee wraps and deadlifted 800lbs raw in competition at only 19 years old. Now being the age of 22, he is currently ranked #2 in the world in the 275’s with a 2,204lbs raw total w/ wraps. His best competition lifts up to date are an 881lbs raw squat w/ wraps (World Record at 275s), 529lbs raw bench and an 821lbs raw deadlift. He is currently chasing after the all time world record total in the 275’s held by Jon Cole with a 2,259lbs raw total w/ wraps. I began training for powerlifting after finishing my track and field career in late May 2010 and experienced a meteoric rise in my strength, adding 200 pounds to my PR squat in the first 14 months of training and competing. I competed in 3 meets during this time span, squatting 800 at the USPA Central California Championships in October 2010, 865 at the SPF Ironman Pro/Am in March 2011 and 905 for the American Record in August 2011 at the SPF Powerstation Pro/Am, all in the 308 pound class. Beginning with a high 600 pound/low 700 pound squat (raw w/ wraps) I used high volume work, heavy training and special exercises to add 200 pounds to my squat in this short time period. Training for my first meet utilized the program that became The Juggernaut Method and focused on high volume work to build size and practice technique. This is when I learned how to train hard, how to strain and began my ascent into the upper echelon of squatters in the World. Assistance work for the squat during this training cycle was very limited and often done by feel. At most I would do 3-5 sets of 8-15 reps of GHRs, 3 sets of 8-12 reps each leg of walking lunges and 3-5 sets of 10-20 reps of weighted ab wheel. Depending on my energy levels for the day that was reduced to either less sets, less exercises or on occasion, nothing at all. This training cycle created my strength base and work capacity for the work that still lay ahead of me. After this meet I sought out the advice of Josh Bryant, who took over my deadlift and bench programming for my next meet. My deadlift was lagging behind my squat and I knew that more attention must be given to it. Josh created a great and extremely demanding deadlift program, which forced me to become more strategic in my squat training. I needed to allow my body recover from Monday’s deadlift training while still building strength during Friday’s squat training. This was done with lower volume work, accommodating resistance to allow me to still feel heavy weights without overstressing my body and CNS and further hone my technique. This was a great meet that resulted in my highest total to date, 2165 pounds. 865 felt strong and I knew there was more in me. Josh and I collaborated on my next training cycle with the singular goal of breaking the American Record in the 308s, which was 903 pounds by Troy Nash. My squat was on the rise in a hurry and the weaknesses we identified was a sticking point about 2” above parallel and a lack of upper back strength/thickness to support heavy weights without rounding over. To squat 900+ I knew that I had to make squat training a higher priority, it couldn’t be secondary to the deadlift this cycle. This lead to the development of The 9 Day Work Week, in which we stretched out the normal 7 day training week to a 9 day week, deadlifting on day 1 and squatting on day 6, along with 2 bench days and a dedicated back training day. There you go, over a years worth of my squat training that helped me add 200 pounds to my squat. Chad Wesley Smith is the founder and head physical preparation coach at Juggernaut Training Systems. Chad has a diverse athletic background, winning two national championships in the shot put, setting the American Record in the squat (905 in the 308 class, raw w/ wraps) and most recently winning the 2012 North American Strongman championship, where he earned his pro card. In addition to his athletic exploits, Chad has helped over 50 athletes earn Division 1 athletic scholarships since 2009 and worked with many NFL Players and Olympians. 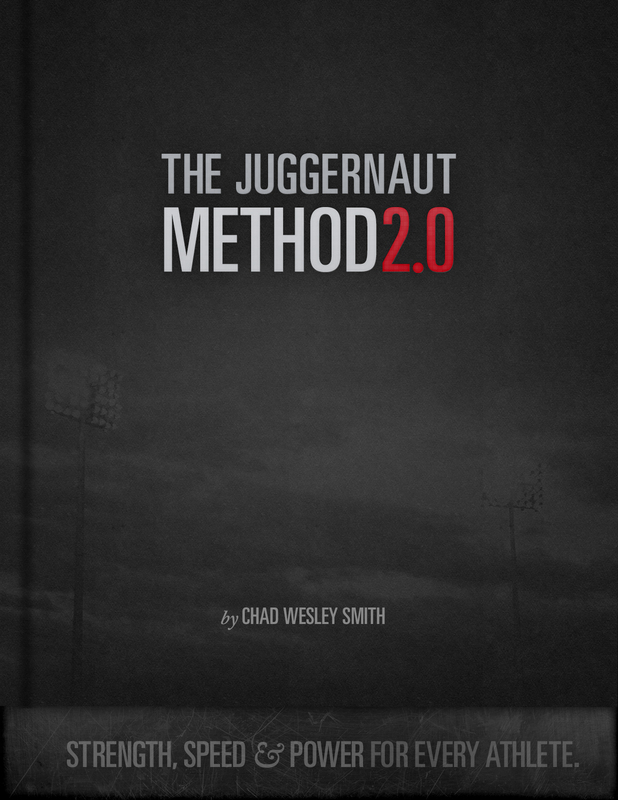 Chad is the author of The Juggernaut Method and The Juggernaut Method 2.0. There is so much that goes into creating a great squat, and there is so much to be gained by possessing one. Properly squatting to depth under substantial load and recovering requires mobile, powerful hips, tremendous torso strength, and massive leg drive. Different schools of thought stress training different aspects of the motion but in the end a bigger squat leads to the biggest improvement in a lifter’s total. But what’s allowed me to make my biggest squat is a combination of techniques and a training style combining volume with heavy maxes and near maxes. I also don’t vary too much in exercise selection but instead tend to rely on a few trusty fundamental lifts. Years of squatting with my hips way back led to my roughest plateau. I had broken 600 but couldn’t seem to get much further. The problem was that as I’d progress past a certain weight my form would break down. I would wind up getting bent over and essentially performing a good morning to complete the lift. I had strong hips and a strong back—I’d sumo deadlifted 770 in my gym at that point—but in my mind I knew I had to make my back and hips even stronger. I was wrong, of course, but I didn’t realize this until I’d been fortunate enough to see some of the world’s best squatters in person. There were certain facts that were evident in real life that did not go unnoticed to me. The first was watching Russian lifter Konstantine Pozdeev squat 815 right in front of me—at 215 lbs bodyweight. He was not a massive or stocky guy but rather long-legged for his height. I was confused. When he took his knee wraps off, though, I was even more confused. I was no longer confused as to how he could squat such a huge weight, but how someone could build up so much mass at the lower end of the quads! My quads looked nothing like his. They didn’t look real. But then my 617 squat looked nothing like his easy 815! It was at that moment I knew I would never make the kind of gains I wanted without building up some serious quad strength. Building up this quad strength went against everything I’d read in Louis Simmons’ articles, but seemed to be in line with the training I’d repeatedly seen amongst world class Olympic weightlifters. The image of Pyrros Dimas crushing front squats in a training hall in Melbourne as he prepared for the World Championships came to mind. There was another guy with seemingly mutant quad development. So I was convinced of the merit of leg strength for a bigger squat. Two major factors controlled my development. First, I needed to come up with a technique change that allowed me to use more leg drive and less lower back strength. I kept the same medium-wide stance and low bar position I’d always squatted with but made it a point to stay more upright, not sit back as much and to allow my knees to travel forward past my toes. Yes, knees past my toes—Used to being told by everyone that’s wrong and unsafe? Fine. Continue squatting like everyone else and expecting your results to be different. Not me. Like I said, I already had strength in my hips and back; I knew any extra weight I could load into my quads would be handled just fine by my back. The key was not to use the improved technique at easy weights and then revert back to back dominant squats at the heavier weights. I decided I would use the back squat as practice but I wouldn’t go above the weight that was essentially my “technical max”, or best weight I could lift with proper form. Since that left the obvious hole in my training of not pushing myself for fear of bad technique, I paired squatting with… drumroll… the leg press! This was fine for a while, but as my technique in the squat got better I really needed a better exercise. I needed an exercise that would really drive my leg strength up, but in the context of squatting. If you’ve read my other writings or seen my YouTube training videos you likely know what exercise I’m about to describe, as it’s the backbone of my squat training. Yes, the front squat. The front squat is perfect as it is impossible for your back to take over the lift. If you’ve trained the front squat you know the back is anything but neglected, but you are not able under any circumstance to allow your hips to shoot up and back and allow your back to take over. You will simply dump the weight. The downside of the front squat is it requires a bit of mobility in the upper back, hips, knees and ankles. It’s also an exhausting and brutal exercise that forces you to strain more to lift lighter weights than a back squat. Your traps and upper back receive a tremendous workload as you fight to maintain an upright posture with a loaded barbell racked across your chest and shoulders. Your glutes will strain heavily to keep your hips from shooting back. All the while your legs are pinned directly under the weight, forcing your quads to power the weight from the hole back to the top. Not to mention your lower back and hamstrings, which tend not to feel neglected. So I had two key weapons. A new technique in the back squat which I believe lifted the ceiling off my squat potential and a foolproof new favorite in the front squat that allowed me to squat to my heart’s content. I was combining my current hip and back strength with ever-growing quad strength and blending them in a technique which allowed for more even loading of all the joints. I’d spoken with a number of other top 220 lifters from the US and Canada regarding training and programming and over the course of 2011-12 honed my training split. All of them squatted 2-4 times per week and deadlifted once. Some of the training followed simple linear progressions and some was instinctive and based on maxing out daily. I was more comfortable with the maxing, and knew from Olympic weightlifting that the effectiveness of consistently squatting to a max has been repeatedly demonstrated. People read about daily and twice-daily maxing and usually think it’s either stupid or it’s awesome! My instincts led me to believe that it can be highly effective but you don’t just jump into such training. It’s tolerance takes significant conditioning and sound technique. With sub-stellar technique the accumulated fatigue would certainly lead to injury. But what can be more effective for heavy squatting than heavy squatting. So I knew I would squat heavy and hit max singles frequently. I also had success with an approach to front squatting that had been recommended to me by world record holding squatter Sam Byrd. It was basically training for weekly PRs but with an emphasis on volume and reps and not missing reps. I adapted his regimen a little bit and had tremendous success! Finally, I’d come to the realization that as great as front squatting is for strengthening the squat, it generally took a few weeks to really transform gains made in front squatting to gains in maximum back squatting. The concept of organizing one’s training into phases such as accumulation, hypertrophy, strength and peaking is by no means new, but I’d effectively stumbled upon the effectiveness of this type of organization of training by accident. I was basically training both the back squat and the front squat every week for months. As my meet began to draw closer, my gains in the front squat finally plateaued. I was able to recognize that this was ok—I’d increased my front squat by 20% in two cycles so I was plenty happy with the progress. I also realized that the kind of fatigue caused by a relatively high volume of front squatting was counter-productive to hitting a big single at a meet or in training. I dropped the front squat day and essentially entered a competition phase where I was doing very little but squatting heavy and in the contest form. I’d gone from a strength and mass phase where I’d back squatted heavy but for low volume on Wednesday and front squatted for high volume on Monday to back squatting heavy on both days. I didn’t always have great squat days twice each week but I continued to hit PRs virtually every week. My basic template was executed with a combination of planned attempts and instinctive attempts. For each set I have the goal of lifting a weight for more reps than ever before, lifting a heavier weight for a set number of reps or matching a number of reps at a given weight for multiple sets, thereby doing more work. I was always chasing PRs that way and it was always objective. I had a max for each rep number for each exercise. Every session I’d see my list of numbers and get an idea in my head of which one I’d like to go for that workout. Subsequent sets were the same way but I wouldn’t decide the attempt ahead of time. This worked great. During this training phase I’d front squatted maxes of: 465×8, 585×6, 500×4, 525×3, and 560×1. I had back squatted maxes of: 696×4, 716×3, 736×2 and 756×1. The 756 was two weeks before the meet and the 736 double was the Monday 5 days before the meet. That day I’d squatted 676×2 706×2 and 736×2. Hitting 3 sets indicated I had stamina to hit 3 good attempts on meet day and being able to hit each for a double usually meant that since the first rep tended to be flawless and the second a grinder that these were safe weights at a meet no matter how ugly they got! And as I mentioned before, my first and second attempts were 700 and 735; matching up really well with weights I had just built confidence I’d nail while still saving enough energy to jump to a PR 3rd attempt at 760. I was after a 2030 total and knew if I could make 730 or 735 I’d be in good shoes. The 760 was icing on the cake and just made for smooth sailing after that. As for the deadlift day 5 days before the meet, I normally don’t deadlift for the final two weeks before a meet, but just the previous Saturday I’d agreed to film a deadlifting workout with Mark Bell at his gym in Sacramento—Supertraining Gym. Unfortunately I’d managed to tear my hamstring while pulling 772! This was my final weight before my top set, but since I’d driven about 2 hours to do the workout and they were filming the sets I didn’t feel like backing out of the session. I decided to lift 815 for my heaviest set of the day. Sure enough the hamstring threw my timing and balance off and when I tried to pull it I got way out of position, failed and felt the hamstring tear much more. Sad face. But… I was determined. After a bit of walking the injury off I forced myself to come back and grind it out. Then I pulled some sets conventional sets from a deficit and called it a day. I was at least confident that with a torn hamstring and on an extremely stiff bar with extra thin eleiko kilo plates I could grind out 815, so this at least gave me a safe starting point for the meet. I did my best to compress it and ice it and down tons of advil and by the Monday 5 days prior to the meet I just wanted a chance to see that I could pull fairly aggressively without the fear of it re-tearing. So that day I pulled sumo from a deficit up to 685×2. While the discussion of a hamstring tear and my subsequent approach to deadlifting isn’t really relevant to squatting, the decision to approach my final workout as a confidence building test really paid dividends at the meet. So there it is. A blend of volume, maxing, high frequency, and anti-dogmatic technique and I’d taken my raw squat from 615 to 760 over the course of 20 months. Front squats were the workhorse and back squats heavy every week turned the strength into results. It was a very simple program, but was very demanding. For the front squats I never missed a single rep. For the back squats I missed many. There was not one week taken off during this period and rarely were there ever any situps, back raises, GHRs or any other accessory motion added. Dan Green is one of the top names in powerlifting today. The Raw Total World Record Holder with 2030 (belt and sleeves), Dan is the dominant force in the 220 weight class. Dan is the founder of Boss Barbell Club in Mountain View, CA where he trains team sport and strength athletes. With squat week kicking off here at JTSstrength, it works out perfectly that my squat is the strongest it’s ever been right now. Having hit 545 lbs. for eight reps a week ago as well as having box squatted an easy 703 lbs. with no belt, I’m improving quickly and my next meet is still two months away. On December 19, having come off a diet down to 220 lbs., my squat was very weak for me and I grinded out a single with 515 lbs. One month later I’m now at 545 for eight reps and I will be attempting to hit twelve reps with that weight tomorrow. So the question is, how did I progress so quickly. The big change was that I started squatting every three days. This is similar to the approach used in the “Smolov Squat Program”, but I feel my approach is more optimal for not getting too banged up and allowing enough recovery time. Those of you who have tried the Smolov Squat Program know that it can either lead to you making the best strength gains of your life, or leave you with a muscle tear. Both approaches are very hard on the body, but I feel my three day approach is more manageable in the long term and more efficient when all aspects such as recovery, injury potential, and strength gains are factored in. As far as rep ranges, I would usually pick a weight near 85% of my one rep max and do it for max reps. Then three days later I would do 90% of my one rep max for max reps. Then three days later you’d do the 85% weight again and try to beat the amount of reps you did last time or you can also take your 85% weight and add ten pounds. So this is what it would look like. Sunday (85%): 545 for max reps. I hit 6 reps.
Wednesday (90%): 585 for max reps. I hit 3 reps.
Saturday (85%): 545 for max reps. I hit 8 reps.
Wednesday: (90%): 585 for max reps. I hit 3 reps.
Saturday: (85% + 10 lbs. ): 555 for max reps. I hit 6 reps.
As far as accessory work, what should you do on these days? You might be surprised to hear this answer, but in all honesty…none. Or you can do one “back-down set” if you’re up for it. This program will tax your body so much and challenge your recovery to such an extent that accessory work for the legs must be eliminated or at the very least, drastically reduced. The back-down set should be done with 65-75% of your one rep max. Bang it out for max reps and then your day is done. Only do the back-down set on days you’re feeling up to it. If your body is too taxed from the top set, skip it. After all, you’ll be back to destroying your legs in three days. They key to this program is constant improvement. You HAVE to beat the reps you did last time or increase the weight. There is plateauing. It is not an option. Some of you might worry about this minimal volume approach, but in all honesty, I’m stronger than ever from this method and my legs are bigger than ever. Transitioning from his early days of running marathons, Pete Rubish is an up and coming star in powerlifting at only 21 years old. He competes in the 242 lb. class where he has squatted 661 lbs. with no knee wraps and deadlifted 777 lbs. His best raw total is 1763 lbs. with no wraps. Pete is currently attending school in Madison, WI.